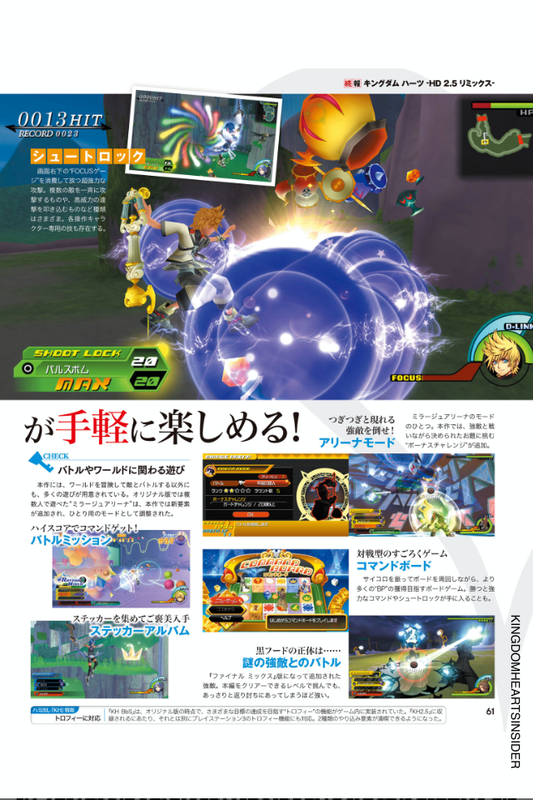 New Kingdom Hearts Birth by Sleep scans from Famitsu Weekly! 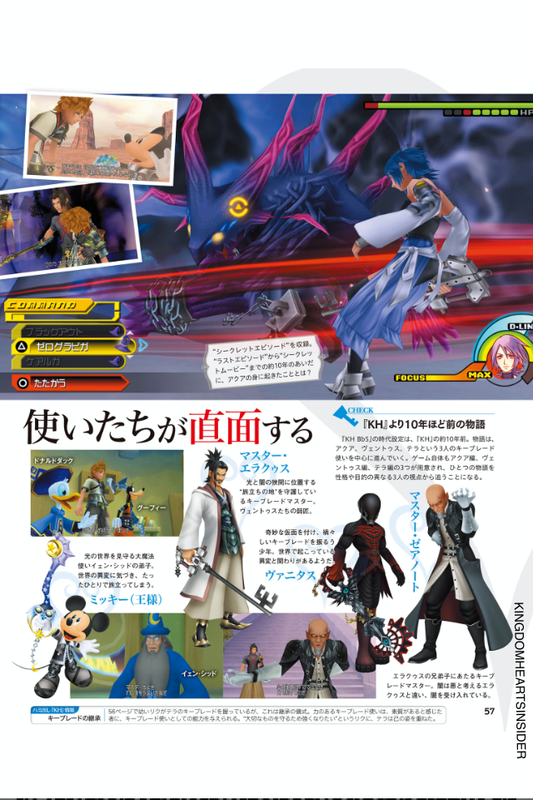 It was announced only 24 hours ago that this weeks edition of Famitsu Weekly would feature Kingdom Hearts Birth by Sleep. Thankfully it wasn't a long wait before we got to see these scans with our own eyes, and boy does this game look gorgeous! Pick up coverage from KINGDOM HEARTS Birth by Sleep! In KINGDOM HEARTS HD 2.5 ReMIX, three works from the KINGDOM HEARTS series has been HD remastered into one collection. For KINGDOM HEARTS II and KINGDOM HEARTS Birth by Sleep, using the overseas version as the base and the added new elements in the FINAL MIX version, and we included the Japanese audio. KINGDOM HEARTS Re:coded has been remade as footage. In this article, we will look into KINGDOM HEARTS Birth by Sleep; introducing its story, game system, and latest footage. An apprentice under Master Eraqus. She is serious and has a sense of duty but she is friendly to Terra and Ventus. He trains alongside Aqua and Terra. And, the two of them refer to him as Ven. With his cheerful and pleasant personality, he can easily become friends with anyone. A person whose demeanor is overlooked, he devotes himself to training. He really cherishes Aqua and Ventus. The story takes place 10 years before KINGDOM HEARTS. The timeline in KINGDOM HEARTS Birth by Sleep is 10 years before the first KINGDOM HEARTS. 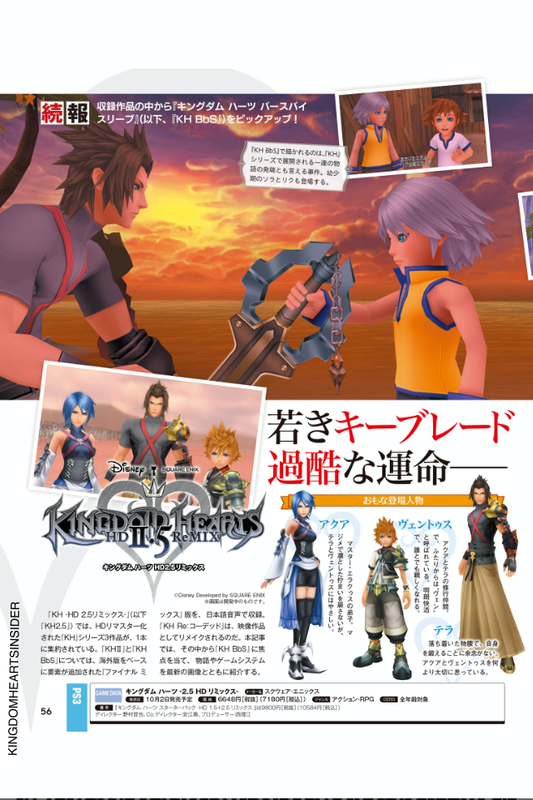 The story revolves around 3 Keyblade wielders: Aqua, Ventus, and Terra. 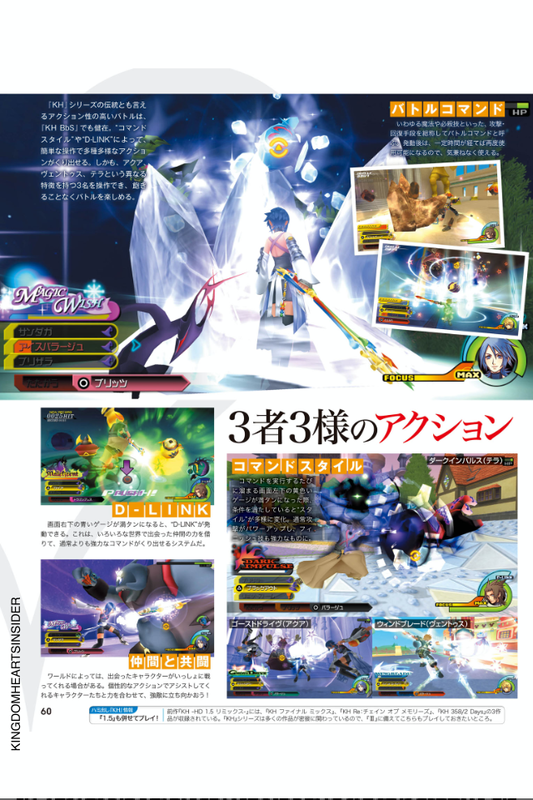 The game allows you to choose between 3 scenarios between Aqua, Ventus, and Terra. It follows their point of view in the story with a different purpose and personality. An apprentice of a powerful sorcerer named Yen Sid that watches over the Realm of Light. He notices trouble in the worlds; resulting him in journeying. A Keyblade Master that protects the world sitting between light and darkness, The Land of Departure. He is a mentor to Ventus and the others. A boy who wears a bizarre mask that wields a Keyblade. He seems to be involved with the accidents going on in the worlds. A Keyblade Master who has trained alongside Eraqus. Unlike Eraqus who believes darkness is evil, he accepts the darkness. There is a Secret Episode. Whatever happened to Aqua between the Last Episode and the Secret Episode in those 10 years? You can't enter unless you have an invitation/ticket to go inside Mickey's Town. There is a Dream Festival taking place and you can partake in many mini-games. 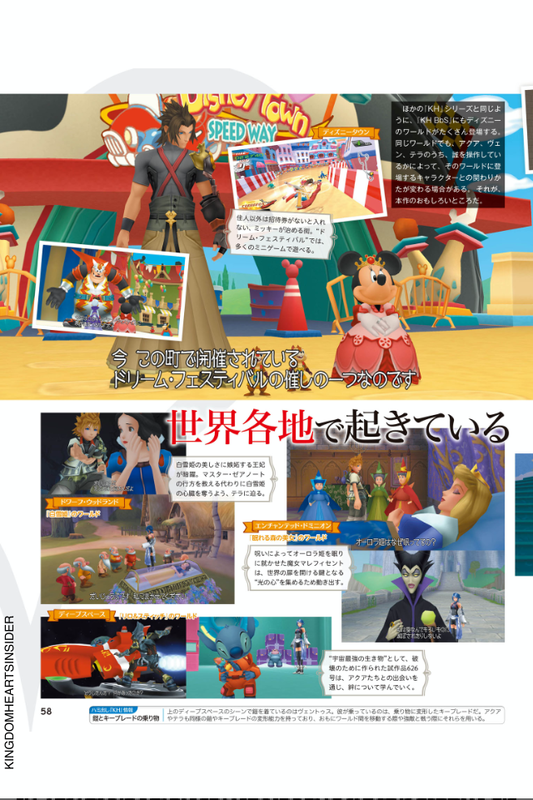 Like in many of the other games in the KINGDOM HEARTS series, many Disney worlds will appear in KINGDOM HEARTS Birth by Sleep. 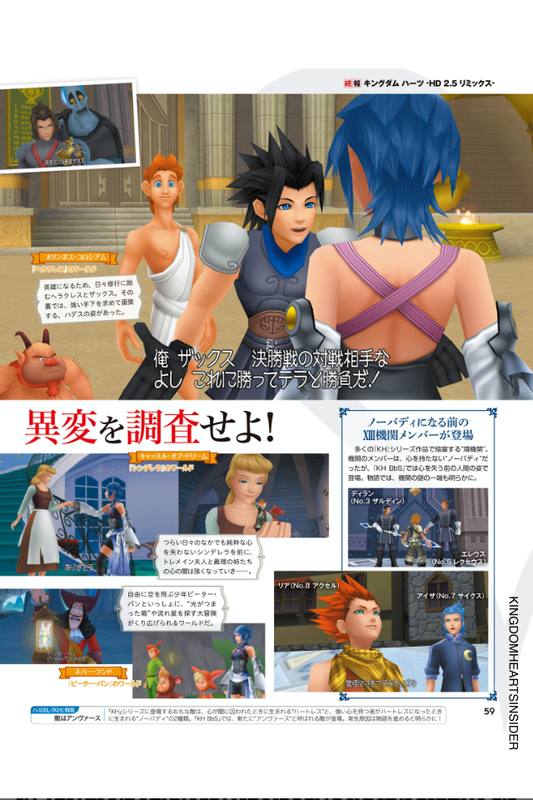 In those same worlds, Aqua, Ventus, and Terra will have different cases where it is dependent on the character you are playing as. That is one of the interesting aspects of this work. A queen is jealous of Snow White's beauty. In exchange to find the whereabouts of Master Xehanort, Terra attempts to rob the heart of Snow White. A witch named Maleficent puts Princess Aurora into a curse of deep sleep and begins her move in collecting the Hearts of Pure Light to open the world's door. A deadly creature no. 626 was created for destruction. However encountering Aqua, they learn about building the bonds between friendship. In order to become a hero, Hercules and Zack try their best to train everyday. Behind the scenes lies Hades who seeks strong minions. It is a world where Peter Pan and his boys fly freely in the sky. They adventure to find shooting stars and shiny boxes filled with treasure. Organization XIII has appeared in many scenes within the KINGDOM HEARTS series. They appear in human form before losing their hearts in KINGDOM HEARTS Birth by Sleep. It helps demystify the mystery behind the Organization. High quality action is a tradition of the KINGDOM HEARTS series even in KINGDOM HEARTS Birth by Sleep. With Command Styles and D-Links, a variety of actions has been implemented with simple operations. It's possible to take advantage of Aqua, Ventus, and Terra with their unique characteristics. You can easily enjoy battles seamlessly. So-called special moves and magic will be referred to as commands as a means to attack or heal. After use, they will become available again after a cool-down. When the blue gauge in the lower right corner becomes full, the D-Link can be activated. It's a system that brings the assistance of friends met in other worlds and powerful commands are brought out. Depending on the world, there is a case where a character fights alongside you. Fight together against formidable enemies! When the yellow gauge on the left screen is full, you will undergo a change in style. Normal attacks are powered up and you'll have powerful finishers. Ranged powerful attacks that consume the focus gauge in the lower right. There are various kinds and you can attack multiple enemies simultaneously; stacking up with impressive damage. Each character also has their own unique ones. Other than to battle enemies in your travels, many obstacles are prepared here. In the original version, Mirage Arena was made that so more than one person can play. New elements have been added and it has been adjusted to be playable for one character. Get high scores with your commands! Battle with a mysterious formidable enemy that has been added in the FINAL MIX version. You can challenge it at the level once you clear the main storyline, proceed at your own risk and strength. Defeat one strong enemy after the other! Play the Mirage Arena by yourself. A bonus challenge has been added for fighting these formidable enemies. Circle around the board by rolling the dice, BP and many other prizes can be obtained in this board game. You can get powerful shotlocks and commands if you win. Kingdom Hearts -HD 2.5 ReMIX- releases in Japan on October 2nd, with North America recieving it December 2nd and Europe on December 5th. Follow Kingdom Hearts Insider on Facebook, Twitter, and Tumblr for the latest updates on Kingdom Hearts -HD 2.5 ReMIX- & Kingdom Hearts 3! Looks like no capes. So much for hoping those got added later in development. I am just in awe of how gorgeous the clouds on Destiny Island look. It looks like a piece of beautiful art. Skyboxes have been redone to be higher res, and it seems like they took some liberties, too. I love these so hard. Like major nerd bone is happening in my pants~ It's going to be so great playing BBS on my home console, the way God intended. Man I can't wait to see how gorgeous the style changes look when this finally comes out. Those textures!!! These are making me cry. I can't wait for the translations to go up! Good luck translator/s!